So far in this series I had only been around the margins of London 2012’s Olympic Games. Things were about to be different. 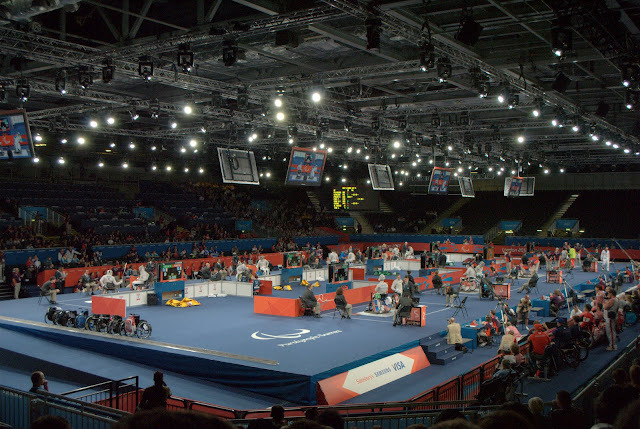 When September’s Paralympics came around, when almost the whole of Britain wanted to this great summer to roll on and on forever, I finally got into the midst of the action with real, actual tickets! 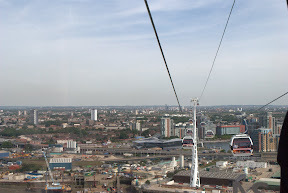 Over two days I would see live sport at the ExCel Exhibition Centre in the afternoon, the Olympic Stadium in the evening, and the second day would be spent at Brands Hatch. A busy two days! As with the visit in the summer the morning was spent taking the train from Dorset to London Waterloo and making my way to the venue. 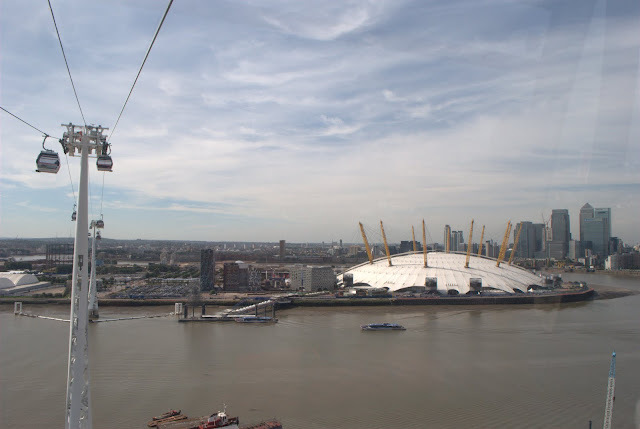 I’d wanted to try the brand new cable car across the Thames but hadn’t yet found a reason to go all that way over there – I mean who would put it there and expect it to be used? 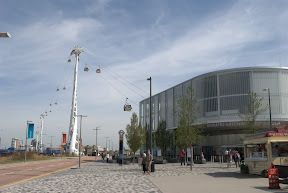 Yet as luck would have it, it turns out the fastest way from Waterloo to the ExCel is to take the tube to the Millennium Dome (the ‘O2 Arena’ as I suppose we have to call it) and use the cable car, which plonks you down about half a mile from the ExCel. 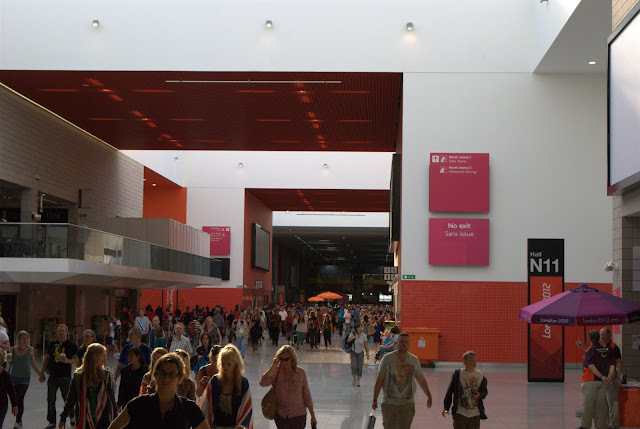 This part of London is a mix of the exhibition hall, conference centres, restaurants and so forth. It used to be the famous sprawling docks of the city and some tributes remain as a legacy. 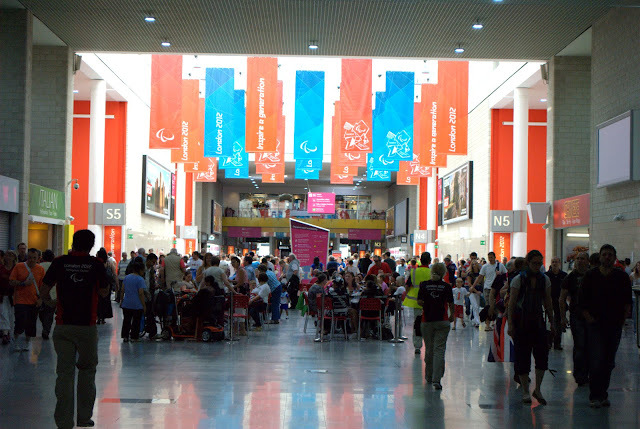 The first thing to do was negotiate the notoriously thorough London 2012 securit, which was as restrictive as airport security: can’t take in more than 100ml of fluid, can’t bring your own drinks, can only bring a small rucksack bag which needed to be emptied in front of them. Not particularly helpful to those who didn’t have time to check into their hotel beforehand (i.e. me) so I had to travel light. The staff, whether G4S or Armed Forces personnel (a lot of RAF) were immensely friendly though and everyone was passing through easily. I had a day pass so I could go wherever I liked. 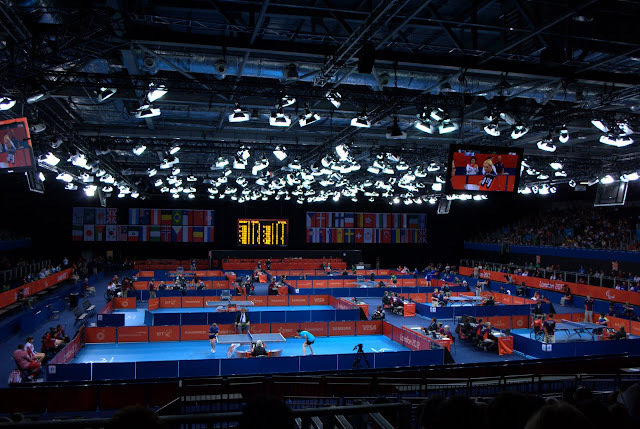 The ExCel was hosting several sports although several coincided so I had to plot my moves. It was quite difficult as you never knew when something might end, and there were quite a lot of people around especially when there was a break between sessions. The worst part was when all sessions ended at once and everyone was queuing to get in to the next one. Nearest the door: table tennis. Let’s do that first. 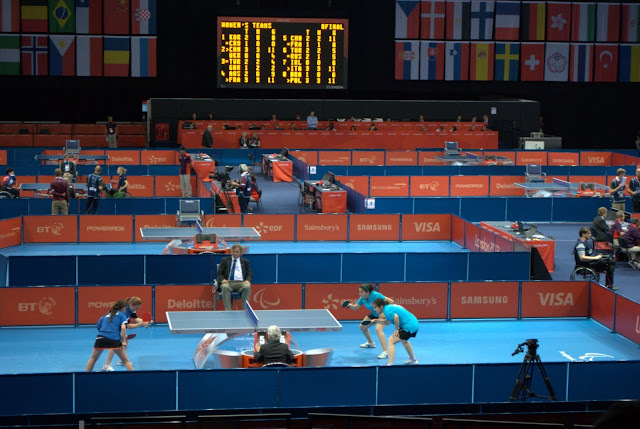 Table tennis arena. 5 games in progress at the same time! One, wow lots of games at once this is a bargain! Two, watching from a distance the tables are quite small and so is the ball. Three, I don’t know anything about any form of tennis except some basics. In fact this whole Paralympic experience was the first time I’d attended a sporting event without knowing anything about the sports or their competitors. Four, as a motorsport fan when I’m trackside I am accustomed to having a radio in my ear with commentary provided by the circuit or the championship. At the Paralympics there was no commentary, although I’d not brought my radio anyway! I was confused for a while especially as the crowd on one side of the arena was getting really animated and were cheering one of the games near to them, which made me think I’d missed something in the game I was watching! I hadn’t, they were just watching a different thing. 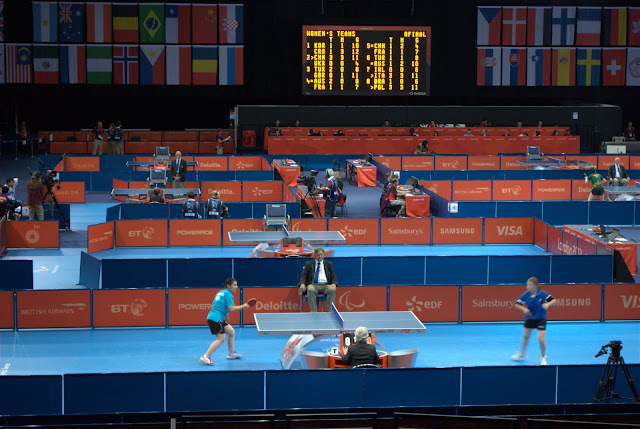 I’d perhaps naively expected several screens perhaps with one for each table, and very clear modern scoreboard. What we had were a few fairly small screens all focussed on the same match and an old-fashioned single-colour scoreboard right outta the 70s with everything abbreviated so you didn’t know what it meant (unless you did). For the year 2012 at an event sponsored by a giant electronics company I was not impressed. It was fun though. Just because they are in wheelchairs doesn’t mean the game is any slower. I’d say it is a lot more impressive playing in a chair rather than leaping around trying to hit the ball, your reactions have to be very fast to hit the ball before it goes out of your more limited reach and that in turn makes for a very rapid game… or a lot of misses. I was on the verge of moving but I started to get really into the game happening in front of me, what I think was Turkey vs Russia. It was a team event and these weren’t in chairs so I guess they were partially-sighted or something. There was a singles, then another singles between the other two, then they finished off playing doubles. I’ve been to Turkey and liked it so I was pulling for them. I could see the scores just next to the umpire there and on the screen at the back (just!). It was a close contest, which is why I didn’t move over to the other stand to watch the British athletes! My memory faded now but I think Turkey just about won. It was close all the way through. And there was good support for the British team. When the game in front of me finished I decided not to stay, instead I went back out into the atrium and head to the fencing which was on at the same time. 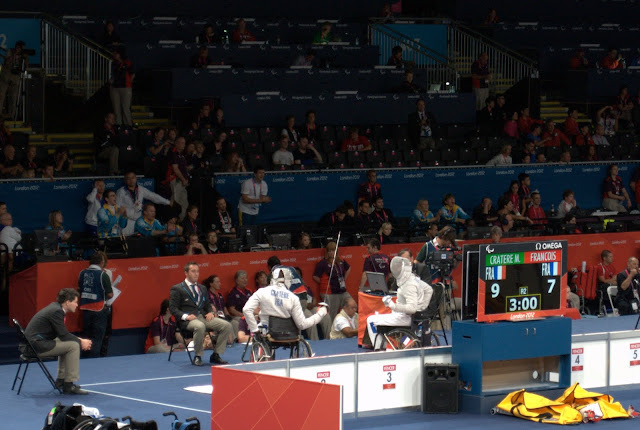 I really liked the idea of wheelchair fencing. I just couldn’t see how it would work, from what I’ve seen of fencing one of the key components of it is the ability to move back and forth to attack or defend, yet these guys were sat in chairs which were strapped to the ground and couldn’t move. How could they have a swordfight? As it turned out it was fantastic. Such a fun sport! Such a fast sport as well. I didn’t have an optimum position so it was hard to see, and again lots of contests to follow which again I found difficult. The nearest me happened to be two Frenchman which I didn’t think was fair on the French team! I missed a lot though. I thought I was being clever in doing tennis first and fencing second but when I stayed longer at the tennis I’d forgotten that would mean less time at the fencing (even though there should’ve been a clear 1hr15min of fencing after the tennis ended which wasn’t the case). Just inexperience with the sports – had I known beforehand that I’d end up liking fencing I’d have allowed more time for it! The second session wasn’t to start until 5pm and I couldn’t stay that long. After lunch and a lot of waiting around for the next set of sessions I gave up on Sitting Volleyball thanks to the sheer mass of people. It would’ve taken ages to get in. I wanted to watch that but so did everybody else! 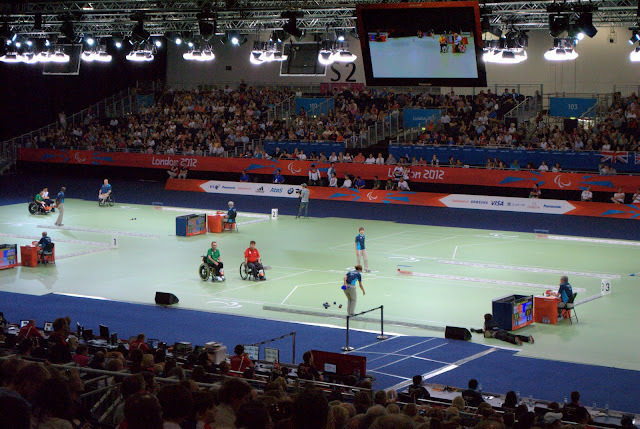 So I went to see boccia instead. 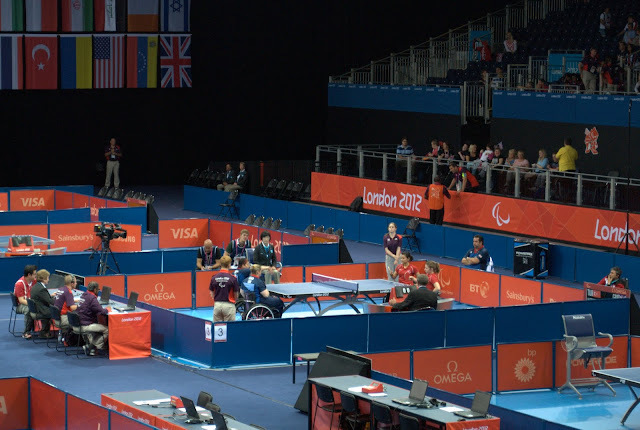 Boccia turned out to be quite boring. It was basically a form of bowls with a shorter field of play and about as interesting as bowls, which is to say ‘not very’. If it had been a variant of skittles or ten pin bowling I’d have been more interested but I suppose they’re a bit harder to throw from a wheelchair. But again, some Brits were in there doing well with a lot of home support and the home crowds were cheering in the right places so they clearly knew their sport so good on ’em. Probably says a lot that I was happier watching the synchronised sweepers. And that was pretty much it. I was there for five hours and saw three sports, queued for lots of things, and after not knowing what to expect I actually came away wishing I’d got there earlier and had more time. I really did enjoy it. Not at all bad for what I’d previously thought was just a £10 ‘filler’ to waste the afternoon before the trip to Stratford! I couldn’t stay any later though, I was off somewhere exciting: The Olympic Stadium! 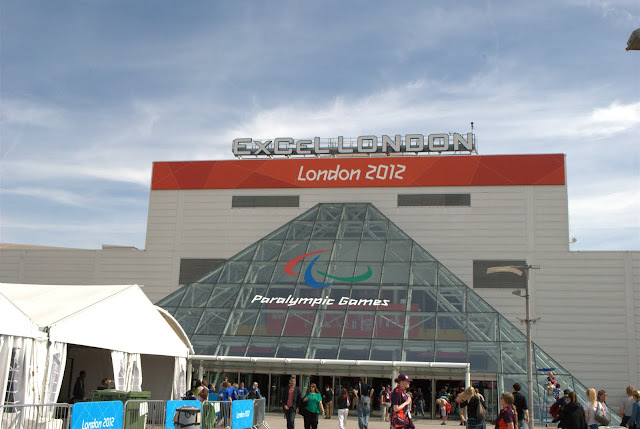 This is part five of my series of posts on London 2012 Olympic & Paralympic Games. There are two later parts. 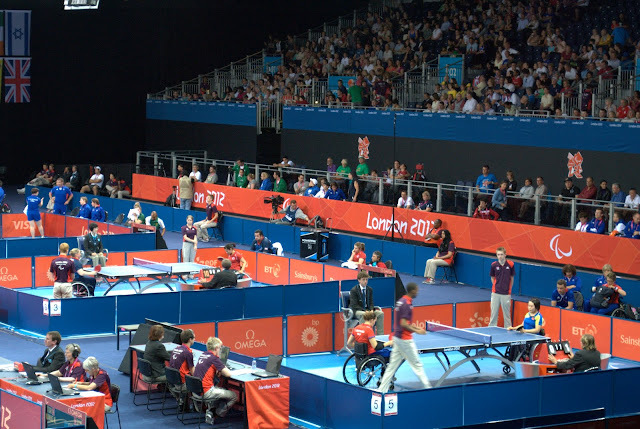 I’m looking back at last year’s summer of sport centred around the London 2012 Olympic & Paralympic Games. Click the links for extra photos. Amy and I arrived in London from Cardiff’s football on Thursday night on a train that was standing-room-only for half the journey, and suffered extensive delays for the remainder. 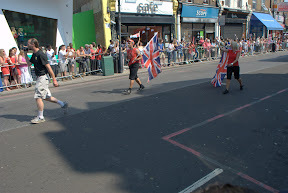 We were quite tired when we crashed at mutual friend’s place, yet were determined to see the Torch Relay on Friday. This was her first and only opportunity to see it, and I’d previously missed it because I went on holiday the day it passed through my town. We’d also convened in London for a get together for the Sidepodcast F1 website community. That wasn’t until the evening. 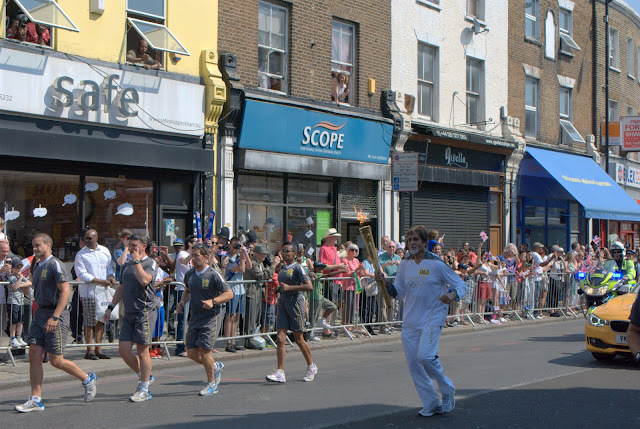 Handily, the Torch was visiting Peckham, just a 10-15 minute train ride away from our borrowed lodgings. It was a gloriously sunny day, we found a reasonable spot and the crowds began to gather, thankfully most of them the other side of the road. You got the sense Peckham had tried to clean up, but there’s only so much you can do with such a crappy place (to me it’s forever surprising how nearby parts of London can be so different). A guy from an Asian TV station turned up (as the pair of us turned our backs and tried to avoid eye contact with him so he wouldn’t interview us) and started talking to camera, saying how it was all very exciting and there was a real buzz, and how many people from Southern Asia were here. It wasn’t quite like that, he was talking while the road was still open to traffic so there wasn’t much buzz yet, and in any case from what I saw Peckham is more a part of the African or Afro-Caribbean communities. The buzz began when the police outriders appeared to great cheers from the crowd. 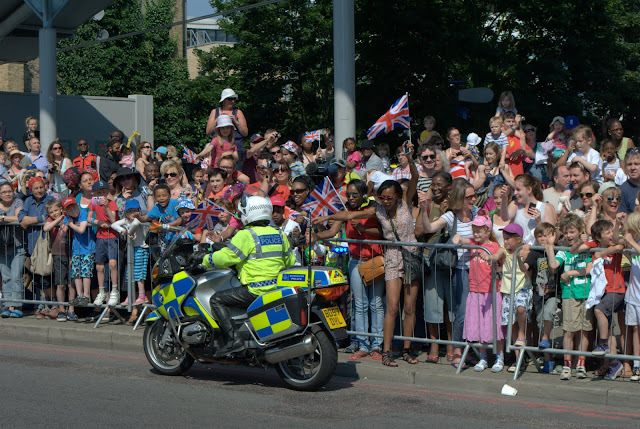 After all the protests and kettling of a couple of years ago, could you have imagined the Met being cheered? Remarkable. It stepped up again when the first parade vehicles arrived. 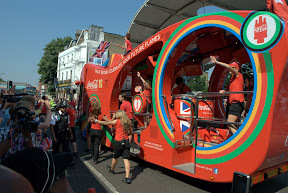 The official sponsors had their own floats with loud music and MCs pumping up the crowd, handing out little free Cokes, then the bus of torch bearers goes by, a fully-grown man holding a big plush Wenlock… then there he is! The torch bearer! And then all of a sudden it was over…for now. The crowds took over the road briefly, we threaded our way back to the station. Once we were clear away from the parade route, to the pair of us non-London folk from the countryside (England and NZ), this didn’t seem the safest place in the world, so we buggered off to the station pretty quickly! For the rest of the day I went for a walk around London. A much longer walk than I’d intended for such a hot day! I didn’t work to any plan except to be at the pub on the Strand by 6pm, so I didn’t take the most direct route. I must’ve walked for three hours in quite a sticky heat. 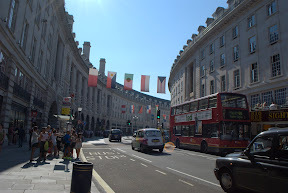 I’m glad I did though, because I got to see London at its’ finest: bright sunshine, as clean and tidy as a major old city can be, all decked out in Olympic trimmings. Here is just a small selection of photos from my journey….and keep scrolling for a surprise! I didn’t expect this on the river. 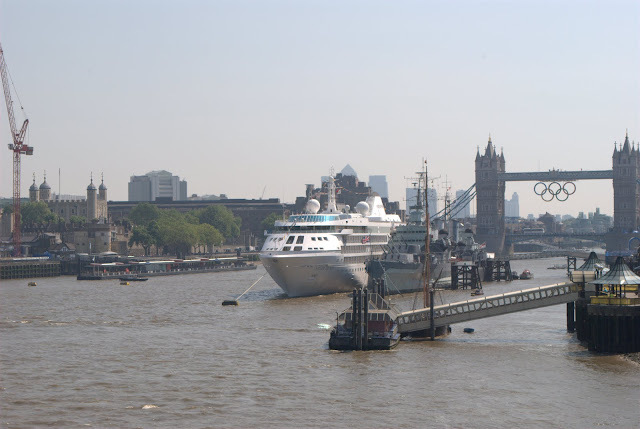 I’d never seen a cruise liner this far into London before, certainly never a ship so large at the Eastern (inland) side of Tower Bridge. 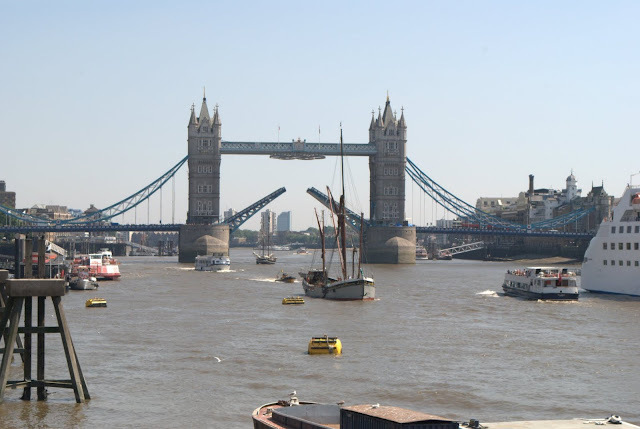 View from London Bridge L-R: Tower of London, MV Silver Cloud moored up with HMS Belfast, Tower Bridge with Olympic Rings on! 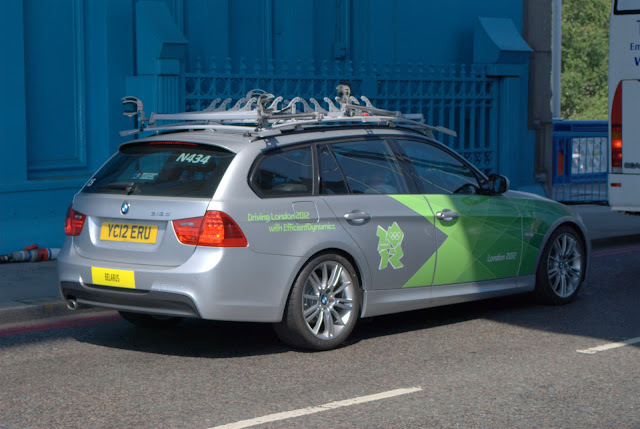 It was fun seeing all the Olympic ‘furniture’, the street signs, the special ‘Olympic lanes’ that Londoners complained so much about before the Games began but in reality didn’t seem to have that great an effect, and the fleet of BMWs being driven around by competing teams, and Games officials. It was fun trying to spy the country name before the car disappeared again. This is Belarus! 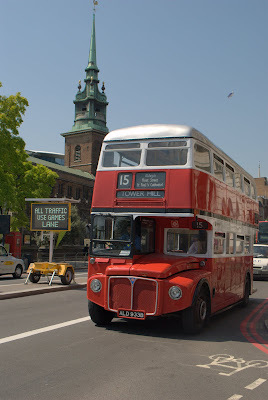 Then you had the Brazilian TV crew riding around on open-topped Routemaster. 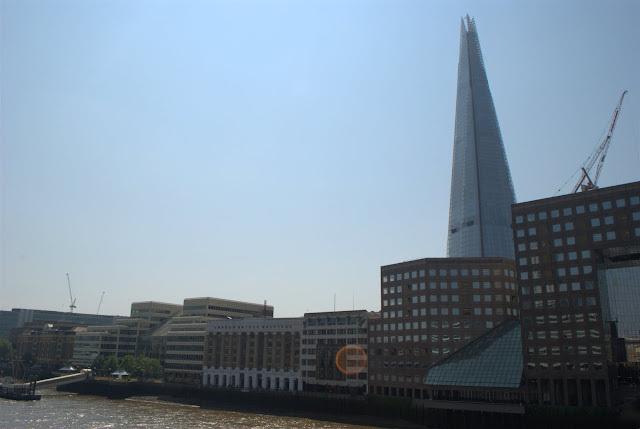 I walked around to the Monument and back to the riverside, the aim being to walk along the river to the Millennium Bridge and look for food. 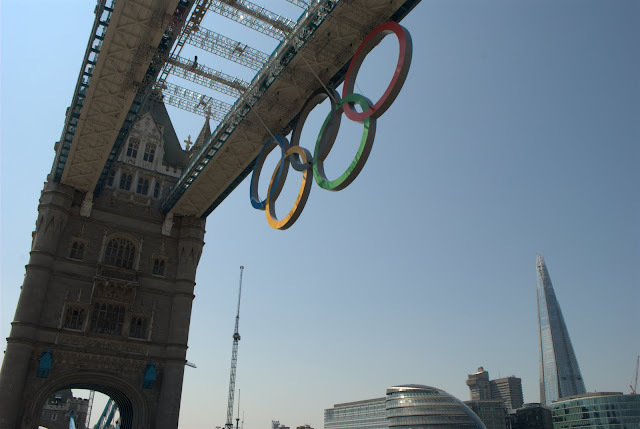 As I got to the banks of the Thames, I looked over at Tower Bridge again – the Olympic Rings had retracted and the bridge was being raised! 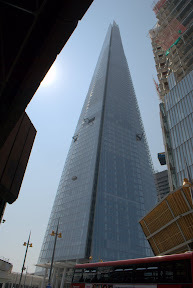 It felt like a long way trying to find a shop in this part of town, not wanting to pay quite high cafe/restaurant prices (especially when on my own – I wouldn’t mind when with people), until I grabbed something from a Pret and sat under the Millennium Bridge just to get out of the sun for a while! I could see the recreation of Shakespeare’s Globe. From there I went to have a look at St Paul’s Cathedral and walked past the front, before thinking, “aha if I just go down Fleet Street I’ll be near the Strand for my pub visit”. I went past whatever this is, and the Royal Courts where the TV reporters always stand outside for the big name trials. I got to the Strand a couple of hours early. Trying to save money, I thought the best free thing to do was to carry on walking, even though I was already quite hot and a bit tired. 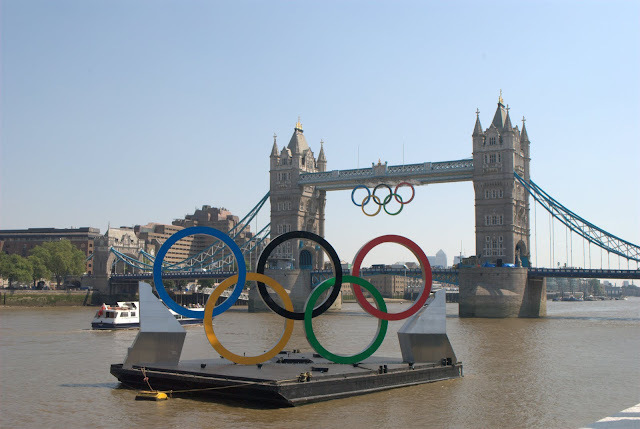 I also wanted to find somewhere a bit more Olympic-themed, or at least somewhere with atmosphere. I found the upmarket foodie side of the market selling very expensive things. I found the tacky corner selling a load of the obligatory ‘Keep Calm’ and slogan tat. I found a happy band! I found Batman! This was more like it. 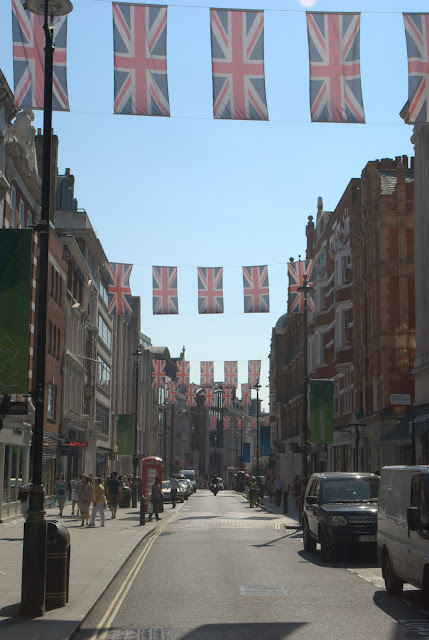 If you go to the top of Covent Garden, past the tube station, you reach a long narrow street called Long Acre. 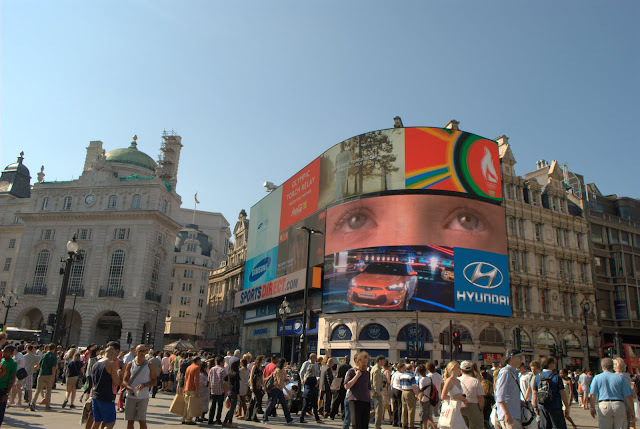 If you wander along there you’ll eventually reach Leicester Square and on to Picadilly Circus. You could watch the torch relay right there! 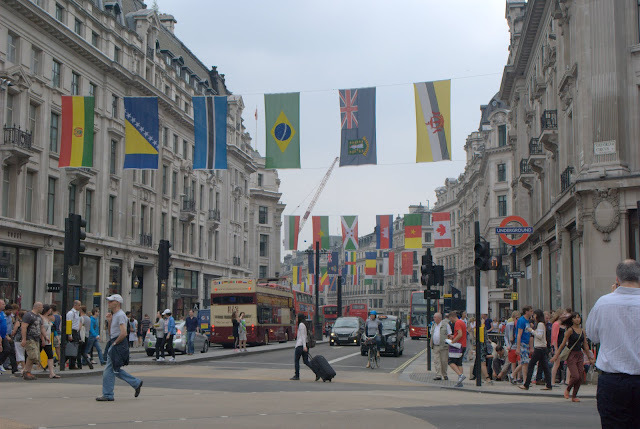 On Regent Street, which makes a 90-degree turn through Picadilly Circus, they’d hung the flag of every single competing nation at the Olympic Games. 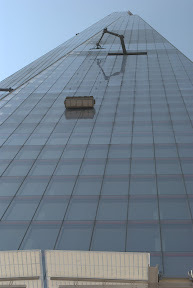 They stretched from the bottom all the way up beyond Oxford Street – not a small distance. 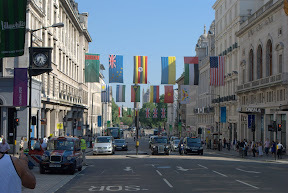 As I was walking around Picadilly, watching the screen, I discovered the Torch Relay was coming this way – I had the chance to see it for a second time! This time in the heart of London! This time the buzz was much greater – I wasn’t going to pass this up. I knew Picadilly was going to be rammed, so I moved up the street, to Shaftesbury Avenue (the heart of theatre land) to find a good spot. And this time.. I took a video with my phone. Admittedly it is an old phone and the camera is not great, and the camerawork is dreadful, even so I really hope it gives you a sense of the moment. The long buildup as we waited, the booming music, and the torch going by! And then it was off to the pub for a well-earned beer after all that walking! The atmosphere in London was far from flat. This being the day before the Games properly opened there was the definite sense of anticipation, the excitement building as you could tell from the video. 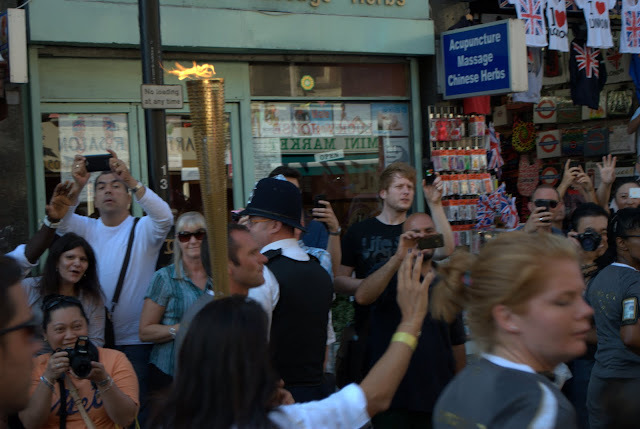 Previously the torch relay was very understated and British, yet now people were gathering in big crowds and cheering! Not long now. 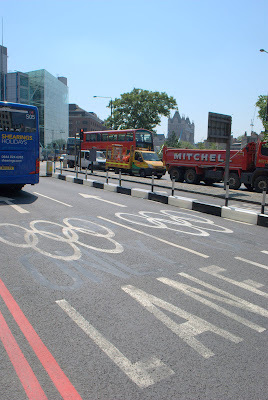 This is part 3 of my delayed series of posts on London 2012 Olympic & Paralympic Games.